The spread of Christianity throughout Europe. In contemporary conversations about decolonization, this is a point which is often overlooked – Europeans are indigenous too. Before the spread of Christianity, Europe was home to a profusion of religious beliefs, most of which are pejoratively referred to as paganism. The word derives from the Latin paganus meaning ‘of the countryside,’ essentially calling them hicks or bumpkins. Some of these pre-Christian belief systems are listed below. A note on the categorization – Indigenous religions are, by their nature, nebulous and dynamic. Unlike the relatively uniform Christian Church, indigenous religions have no codified dogmas and no universally ordained ways to worship. Celtic polytheism, for instance, was less of a religion in the modern sense and more of a spectrum of beliefs and practices. The Celtics tribes in Ireland, Gaul, and Galatia may have had some common rituals and an overlapping pantheon of gods, but they were also influenced by neighboring traditions and their local environments. Balkan – Dacian (Zalmoxianism), Thracian, and Illyrian polytheism, and Albanian mythology. Baltic – Latvian (Dievturi), Lithuania (Romuva), and Prussian (Druwi) polytheism. Berber and Punic – Traditional Berber religion, and Punic religion. Celtic – Celtic polytheism (the religion of the druids), and the syncretic Gallo-Roman polytheism. Germanic – Old Norse (Forn Sed), Continental Germanic (Irminism), Anglo-Saxon (Fyrnsidu), and Gothic polytheism. Hellenistic – The Roman religion (Religio Romana), the Roman Imperial Cult, the Ancient Greek religion (Hellenismos), the Luwian religion, the Eleusinian Mysteries, the Dionysian Mysteries, and Orphism. Iranian – Zoroastrianism, Mithraism, the Sarmatian religion, the Scythian religion (Uatsdin), the Mesopotamian religion, and the syncretic Zoroastrian-Armenian polytheism. Sami – Sami shamanism, animism and polytheism. Semitic – Judaism, Semitic polytheism (including the Canaanite religion and the Nabataean religion). Slavic – The Slavic religion (Rodnovery). Uralic – Finnish (Suomenusko), Estonian (Maausk), and Hungarian (Ősmagyar Vallás) polytheism. Christianity gained converts through the work of missionaries like Saint Patrick, through royal decree like Constantine’s Edict of Milan, and by force as in the Northern Crusades. By the Middle Ages, so entrenched was Christianity in Europe that the continent was commonly referred to simply as Christendom. But the Christianization of Europe was not as absolute as many now think. Pagan traditions survived independently for centuries in some places long after they had been officially Christianized. True to its etymology, pagans found refuge in rural areas. Some of the later attempts to extinguish the remnants of indigenous religion in Western Europe include The Spanish Inquisition and the witch hunts of the 16th, 17th, and 18th centuries. The traditional Sami religion in Northern Scandanavia and the Mari religion in the Russian Plain were never fully eradicated and their practice continues today. For other traditions whose lineages were broken, the new generations that have begun to revive them are collectively called neopagans. 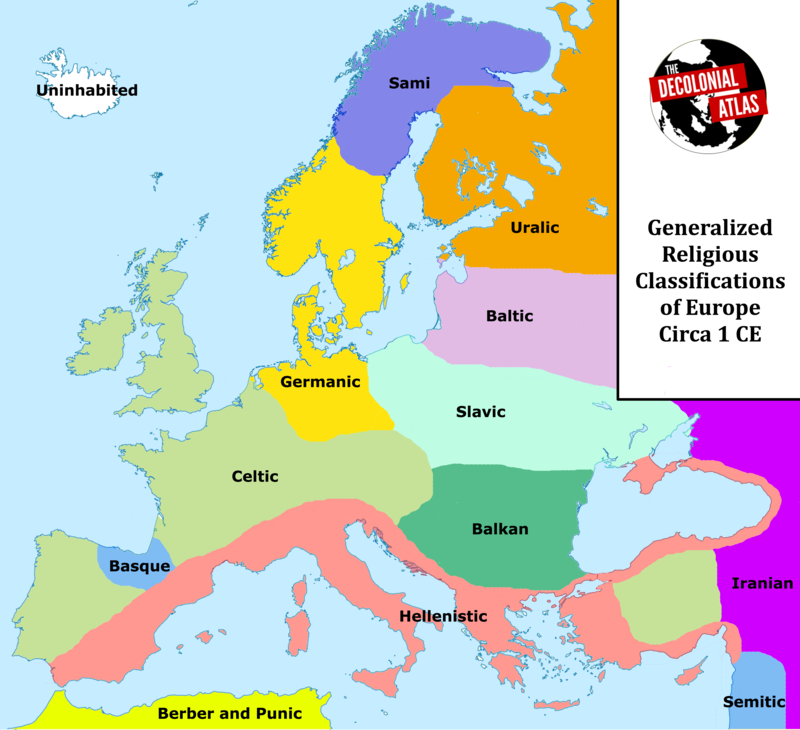 The Christianization of Europe and Generalized Religious Classifications of Europe Circa 1 CE maps by Jordan Engel can be reused under the Decolonial Media License 0.1. Ancient polytheistic religions have always fascinated me ever since my mind started to grasp the concept of this subject bit by bit. So here’s an article detailing the religious landscape of Europe before the continent got Christianized. Comments are suggesting updating the info regarding timing. Wonder if the mapmaker is going to update the timing? East Germany was slavic religious. It was never germanic, because nobody had found germanic things in this region. Good idea, but the facts are not right for northern Scandinavia in the area you call Sami. To your first map dated 1 AD the situation in northern Scandinavia is not exactly as you state. People have been living in these areas since the last ice age (arounnd 12000 years back from now). The first people living there were Caucasians. The Sami people immigrated to this area sometime around 2000 years ago, so of course maybe there were Sami people there at 1 AD, but there were for sure not only Sami people there at that time. 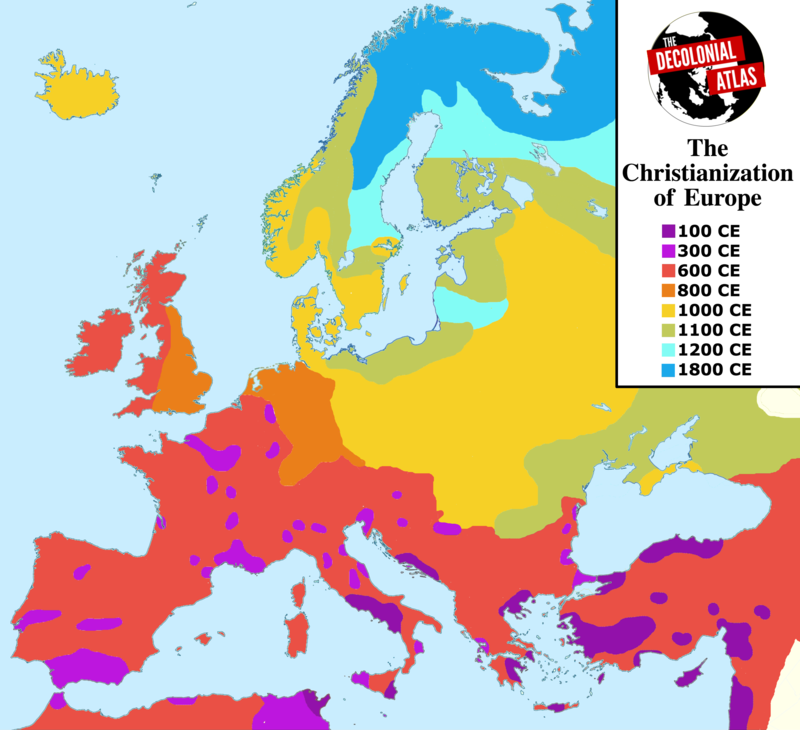 To your second map showing the spread of Christianity around Europe you say that Christianity came to northern Scandinavia 1800 CE. That’s very far from correct. I come from the coast of eastern Finnmark in that area and the first church in my hometown is from between 1100-1200 CE. So in fact not much later thanChristianity came to the southern part of Scandinavia (Norway and Sweden). Cool idea! But the dates are not accurate for Ireland, Scotland and England at least. The Christianization of each place happened over centuries. Ireland and Scotland’s Christianizations began in the 5th century, and England’s began in the 6th (though this is complicated because there were already Brythonic Christians who had been displaced by the pagan English incomers). I think this map would have benefitted in general from breaking down the crucial period between 300 and 600 rather than lumping them all together. Although it’s widely used, “Celtic” is a Victorian construct I think, lumping all non-Xian non-Anglo together. While OK for general use, a more detailed exposé lIle this one could highlight that… perhaps even be topic of a future post? However, if it’s fronounced with a soft “C” as in the basketball team, that’s a different story.